Mr Michael Cummins (left) the Chairman of the Flame Awards Committee addressed the audience of the Flame Awards at the Sir Garfield Sobers Gymnasium. The event was conceptualized in 2001 and the first presentation was help at the Sherbourne Conference Centre in 2002. 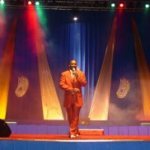 The Flame Awards is all about encouragement "We think it is necessary to encourage our Christian artistes to develop their music as well as the other artistic expressions like dance, drama, etc. We have now encapsulated our aims and objectives in our mission statement: "Rewarding excellence is our purpose". "There is too much talent in our neck of the world to ignore it." He commented that there was a serious request to produce new worship music. "We are producing some of the best in music in various areas so why not in Gospel?" He thanked the secular radio stations for playing Gospel music and complimented the Christian radio stations for supporting the local artists, as well as pleading with CBC to update some of their music files! He encouraged all the media to give more exposure to local and regional Gospel artists. Seen here the MC 'Sunshine' from the very popular Love FM radio station. 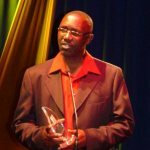 Ian Estwick, CEO of the National Cultural Foundation stated at the Flame Awards that a Gospel show was to be added to this years Crop Over calendar which was in keeping with the festivals aim of being 'more than a carnival' covering as many different interests as possible. Mr Estwick congratulated organiser, Mike Cummins, for following through with his vision for the local Gospel industry and showing his faith in it by taking it to the Sir Garfield Sobers Gymnasium in the first place. "We at the NCF understand too well the magnitude of effort that is required to host an event of this size" Mr Eastwick also commended the show's longevity as well as the fact that it recognised current trends and varied its categories accordingly. He was pleased to see that many of the awards went to young artists, stating that the young generation of Gospel performers were part of the legacy left by pioneers such as Joseph Niles and Sister Marshall to mention to few. Praise Academy of Dance Barbados began in 2003; it is an affiliate of Praise Academy of Dance Jamaica. Marcia Weeks and her team were at the Flame Awards this year where they picked up the award for artiste of the year, plus, dance group of the year and dance act of the year. 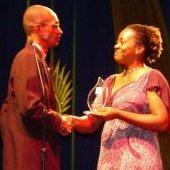 Her son Dan Jamal-Weekes won the creative act of the year and husband, Dave Weekes, picked up the award for recording of the year with Voice in a Voice Vol 11 - The Experience Tent. The Awards are an example of the myriad talents we have in the bosom of the Christian community. 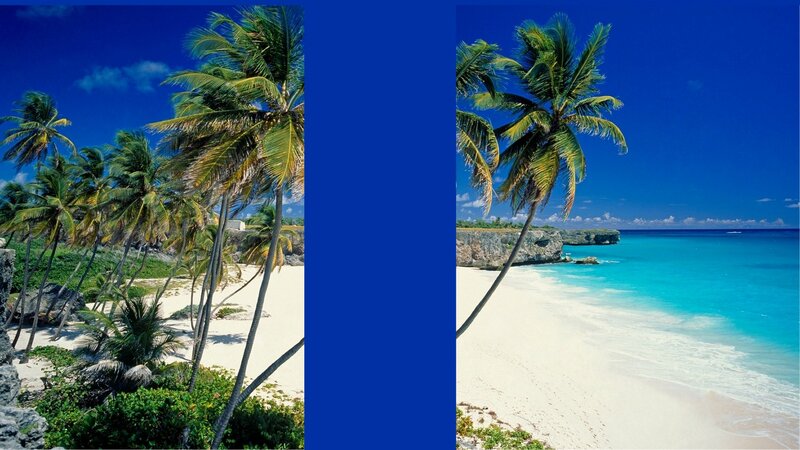 Barbados Gospelfest was established in 1993 by the Barbados Tourist Board (BTB). The festival was the brainchild of the then Minister of Tourism Wes Hall, now Rev. Wes Hall. 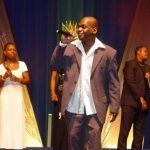 In 1995 the responsibility for the production of the festival was passed on to the Gospelfest Organising Committee made up of persons from the Christian community, chaired by Barbadian event manager Adrian Agard. Adrian was at the Flame Awards 2006 to pick up the sought after Vision Award. The event was divided into six presentations covering various artists. Flame Awards are hoping that by rewarding our Gospel artistes they would see the need to aim for excellence in everything they do. CLICK to meet the winners. Making special guest appearances along with the artistes celebrating 25 years of achievement are Rommel, Allison Norville-Forde, Jesus Army, Praise Academy of Dance (boys), Image, Sheldon Hope and Ria Greene CLICK and enjoy!